Home › Sports and Recreation › World Series Obstruction: Intent or Not Intent, That is the Question? World Series Obstruction: Intent or Not Intent, That is the Question? Rule 2.00 (Obstruction) Comment: If a fielder is about to receive a thrown ball and if the ball is in flight directly toward and near enough to the fielder so he must occupy his position to receive the ball he may be considered in the act of fielding a ball. It is entirely up to the judgment of the umpire as to whether a fielder is in the act of fielding a ball. After a fielder has made an attempt to field a ball and missed, he can no longer be in the act of fielding the ball. For example: If an infielder dives at a ground ball and the ball passes him and he continues to lie on the ground and delays the progress of the runner, he very likely has obstructed the runner. That’s almost exactly what happened in the final play of the game, except that it was a thrown ball rather than a hit ball. Because of the obstruction call, the Cardinals won the game. Needless to say, Red Sox fans were not happy! That has set off a spirited debate about the obstruction rule. 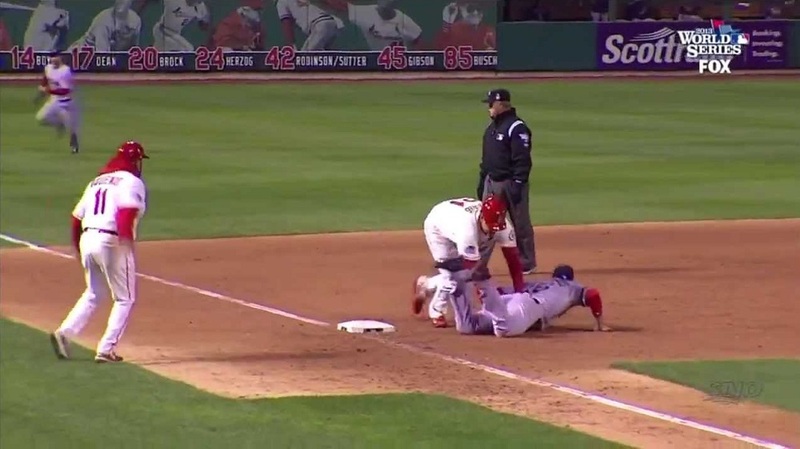 Why should there be a penalty when the Red Sox fielder obviously had no intention of obstructing the Cardinals’ runner? Spiritually speaking, this has a lot to do with the difference between evil and sin. But before we get there, let’s take a look at the unusual call that decided a World Series game. It was the bottom of the ninth inning, and the game was tied at 4 all. The Cardinals had runners on second and third. They were keen to break the tie and win the game. Cardinals batter Jon Jay zipped a ground ball to the right that should have clinched it. But Sox first baseman Dustin Pedroia made an amazing diving catch and threw out third base runner Yadier Molina at home. Two outs. So far, so good! But that’s where it got complicated. Looking up, Sox catcher Jarrod Saltalamacchia thought he had a play at third on Cards runner Allen Craig. Craig, who was nursing a foot injury, was not running well. So against conventional wisdom, Saltalamacchia fired the ball off to third baseman Will Middlebrooks, looking for that crucial, inning-ending third out. Middlebrooks dove to nab it, but missed the ball as Craig slid into third. Craig, seeing the ball heading toward the left field stands, got up to run home. But Middlebrooks was still flopped on the ground in front of him. Craig tripped and fell over his body, then got up and continued his wobbly run toward home. He was tagged out at the plate. Even the announcer couldn’t believe what he was seeing: home plate umpire Dana DeMuth threw his arms wide to signal that Craig was safe, then pointed to third base umpire Jim Joyce. As the confusion untangled, it turned out that Joyce had called obstruction on Middlebrooks. In DeMuth’s judgment, Craig would have made it home safely if Middlebrooks’s obstruction hadn’t slowed him down. Craig’s run put the score at 5-4, and the Cardinals walked away with the win, putting them ahead of the Red Sox 2 games to 1 in the World Series. But it didn’t matter. The rule doesn’t say anything about intention. The fact was, Middlebrooks had obstructed Craig, who could have made it home safely if his baseline had not been obstructed by an opposing player. The Red Sox and their fans had to grudgingly accept that Joyce’s obstruction call was correct according to the rules. Click here for an analysis of the applicable rules, along with a video in which the umpires explain that intent is not a factor in this rule. But the talk the next day was all about how that rule should be changed! Clearly, the rule is aimed at ensuring that the defense doesn’t willfully obstruct runners to prevent them from advancing to the next plate. Clearly, it’s not a fielder’s fault if, after attempting and missing a play, he simply can’t get out of the way in time to avoid obstructing the runner. Apparently the Major League Baseball organization does plan to review the obstruction rule in the wake of this high-profile case. But not everyone thinks it would be a good idea to change it. As it is now, the rule is clean and easy to understand, and it does not require umpires to read the minds of players. Adding intent would likely make any obstruction calls even more controversial as each side argues whether the offending player really intended to obstruct the runner. Practically speaking, leaving out intent puts the burden on the defending team. If they’re in the way of the runner and they’re not making a play, then the rule applies. This ensures that a wily player cannot, for example, attempt a play a ball that he obviously can’t catch, conveniently sprawling in front of a runner in the process. It puts defending players on notice that they must avoid obstructing runners if they possibly can—and if they can’t, the advantage goes to the runner. Let’s say you’re speeding down the highway at 85 miles an hour in a 65 mph zone. Does the police officer wielding the radar gun care if you’re speeding on purpose? Not at all. If you’re speeding, you’ve broken the law whether or not you intended to break it. This makes the law clear and simple. It puts the burden on drivers to know and observe speed limits, for the sake of safety on the road. Officers don’t have to read the minds of drivers in order to stop them and ticket them for speeding. Speeder: I didn’t know that there were speed limits! Officer: And they gave you a driver’s license?!? Speeder: It looked like an “8” to me! Officer: When did you last get your vision checked? Speeder: I didn’t realize how fast I was going! Officer: See that dial on your dashboard? That’s called a speedometer. Here’s your ticket. Sometimes intent does matter under the law, such as when determining whether a killer is guilty of first degree murder or only of manslaughter. But most laws don’t specify that the offender must have intended to break the law to be considered guilty. Those who violate the law will be subject to penalty regardless of why they violated it. This allows communities and nations to maintain order and protect people from harm without having to engage in endless debates about intent. If you hurt someone or engaged in activities that are very likely to hurt someone, you will be penalized. Then you and others will be put on notice not to do that anymore. Spiritually, we’re meant to learn and understand the rules, too. That’s the baseline for spiritual life. Ideally, our parents will train us to know right from wrong, and get us started on living a good and moral life. This continues with teachers, ministers, and others whose vocation or avocation is to guide us on right ways of living. By the time we reach adulthood, we’re meant to know the basic rules of how to treat one another. But what if we don’t know those rules? What if we were taught badly, and given bad examples of how to live? What if, through no fault of our own, we say and do things that we shouldn’t, and that hurt other people? The fact is, if we do immoral, unethical, and reckless things, we’re very likely to hurt other people. And when we do, the damage will be done, whether we intended to hurt them or not. Although we may not be held spiritually culpable, we have still done something evil. That’s the difference between evil and sin. Evil is anything that goes against spiritual and moral laws because speaking and acting in that way is harmful to others and to ourselves. Sin is when we intentionally do what we know is wrong. And yet, whenever we do something that is wrong, even if we didn’t intend to cause harm, it is an opportunity to learn right from wrong. When we see that we’ve hurt someone; when people get angry at us for something we said or did; when we lose a job or a relationship because of our attitudes and actions, from these consequences of our actions we can gain further lessons about what is right and wrong. Based on what we have learned, we can change our behavior. And if we don’t? Then instead of just being unintentionally evil, our actions become sin. This is what Jesus was talking about when he said, “If you were blind, you would not have sin. But now that you say, ‘We see,’ your sin remains” (John 9:41). Back to baseball, now every fan of American baseball knows all about the obstruction rule. And any professional baseball player that didn’t know about it before certainly does now! Assuming the rule isn’t changed, there will be obstruction calls in the future in which the player simply couldn’t get out of the way in time. But with this high-profile World Series obstruction call, it will be a long time before any player or fan will not know exactly what the rule is, and what the consequences are for breaking it, intentionally or not.